Beautiful interiors, excellent service and the spirt of bygone times. 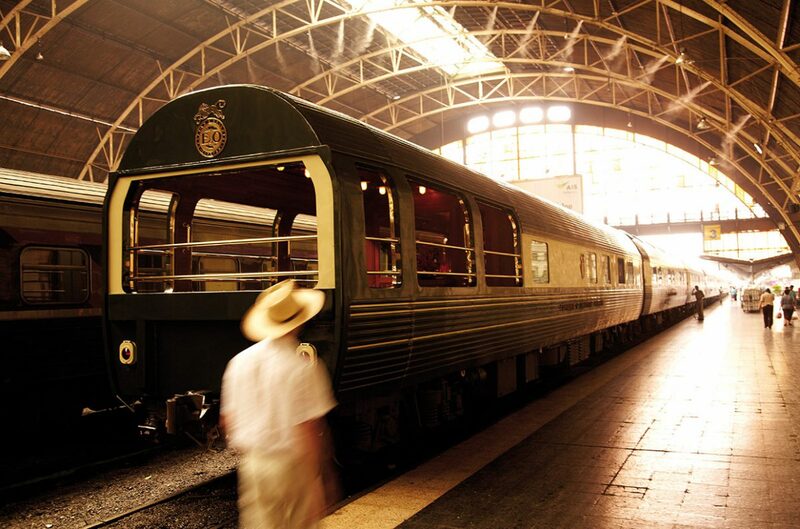 The art of traveling is celebrating a comeback with leisurely rail travel as the hot trend. Step on board – and surrender everything: your luggage, your stress, your everyday routine. Sink back deep into the soft cushions, surrounded by polished teak paneling, Chesterfield sofas and thick velvet drapes. Sip a glass of champagne and relish the thought of having absolutely no obligations or commitments. Welcome to mindfulness combined with travel. 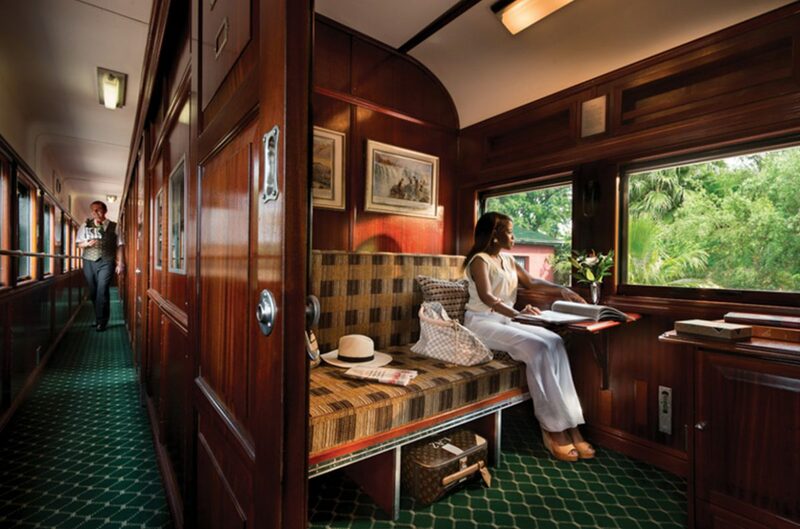 This is how luxury rail travel is done. Cruises are all well and good, but the sight of nothing but water for two whole weeks? And the thought of what you could be missing on land? Rail cruises combine the best of both worlds: you’re always in the thick of things – and whizzing on to the next experience. Cities and landscapes, mountain passes and isthmuses are both the journey and the destination. Naturally, there are stops for excursions, mainly for iconic spots like the Great Wall of China, the Taj Mahal, the Victoria Falls. Or to pick up some local souvenirs: diamonds in South Africa, whisky in Scotland, spices in India. You may not get much time to linger in one place, but isn’t that an excellent reflection of modern life? Beauty is transient. To rattle leisurely across thousands of kilometers gives us something we sorely lack in this fast-paced day and age: deceleration, enchantment, contemplation, time for idle reverie. Plus the opulence of a bygone era, when people traveled with hats and walking sticks, pigskin trunks and ladies’ maids. Glamorous travel was once the sole preserve of the very wealthy. Today, in comparison, luxury rail travel is positively democratic. A glance around the cars reveals a lot of functional unisex garb, interspersed with the occasional tuxedo in the dining car. 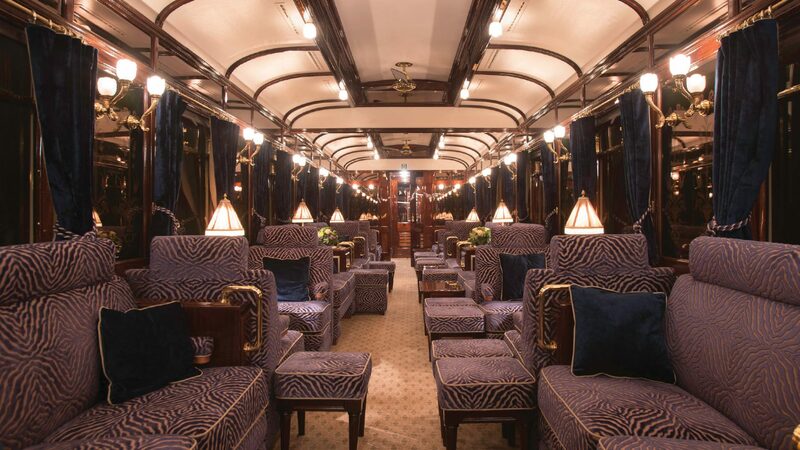 Take, for example, the Orient Express, the grandfather of luxury trains – and a byword for glamorous travel after Agatha Christie chose it as the setting for a murder mystery. Six films have been set on this train and a remake of Sidney Lumet’s 1974 classic comes to the silver screen in 2017, demonstrating the irresistible and enduring allure of this iconic train. Today, incarnations of the Orient Express rumble down the rails on all continents; the wagons are restored or replicated, the train names as beautiful as the majestic landscapes they purr through: the Royal Scotsman, the Pride of Africa, the Andean Explorer, the Northern Belle. Even the Japanese, inventors of the high-speed Shinkansen bullet trains, have jumped on the luxury retro train wagon; their version is called Seven Stars in Kyushu and it crosses volcanic mountains, bamboo forests and tranquil bays on the nation’s southernmost island. The man we have to thank for the concept of sleeping cars or even comfortable compartments is the American engineer George Pullman. On a train journey he took around 1860, he endured such an uncomfortable night on his hard seat that he dreamed up the idea of carriages with sleeping berths, and later built luxurious sleeper cars. 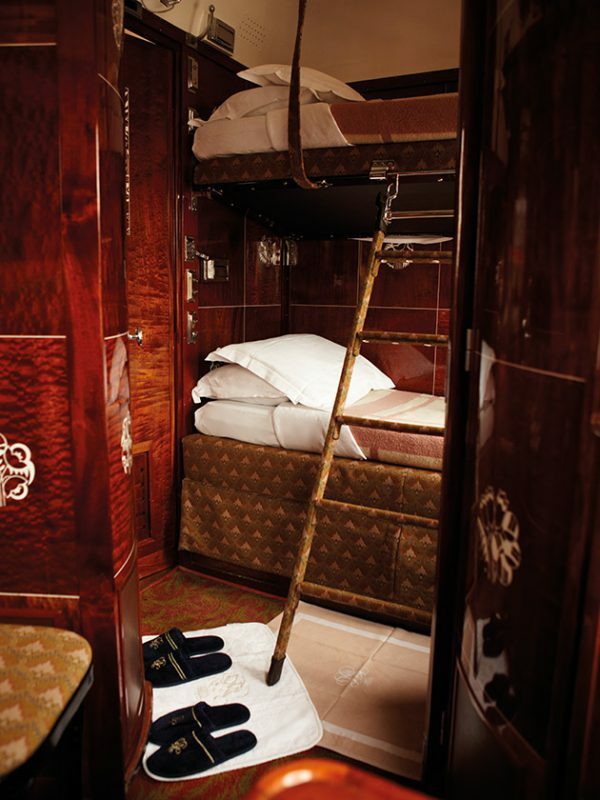 Guests on a Belle Époque-style trip can look forward to a wide range of lavish services. The liveried staff are attentive, and although they themselves sleep in tiny cabins, are unfailingly cheerful and friendly as they set the tables with silver and crystal for lunch and dinner, polish shoes, or organize clothes should your suitcase have been mislaid en route from the airport. In India, guests can slip into the typical local kurta pajamas, cotton pants and a tunic, and discover instantly that not only is this loose outfit a lot more comfortable than jeans and a T-shirt, it is also more authentic. Clad like a local, you can spend the day lounging in your suite without having to leave the damask-sheeted bed even to sightsee, thanks to the large panorama windows. For a few days, one travels stylishly across the country – in luxury liners like these, train travel is practically a symphony. 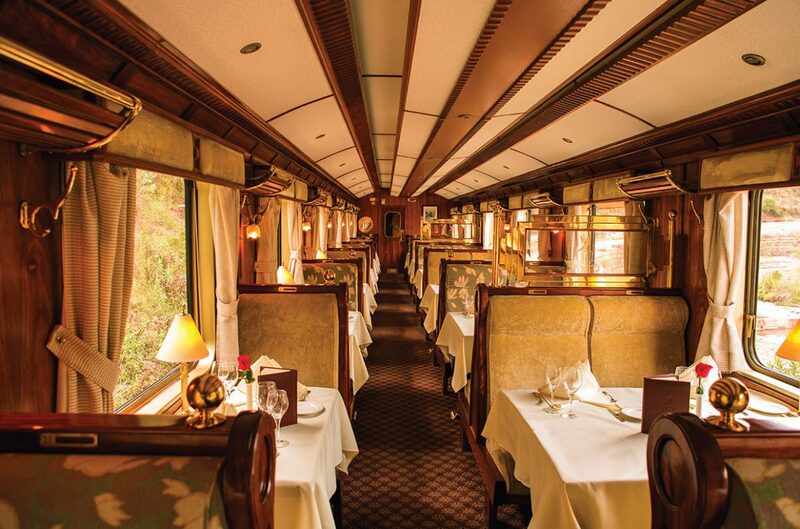 One could call these trains nostalgic, but they are also most definitely rolling 5-star hotels. In this setting, laptops and tablets seem slightly out of place, like ­techies at a gala ball, but they mark the dawning of a new age. The guests are getting younger, are gradually nudging out the wealthy 50-plus best agers with a few thousand dollars to spare for an elegant rail cruise. Honeymooners have discovered rail cruises in a big way. To be able to show friends and family wedding photos in front of the Trans-Siberian Railway gets you real bragging rights. Anyone can do a Caribbean beach. And if you balk at the price, bear in mind that it includes all meals, a doctor, and sometimes even a historian. In the Indian Maharajas’ Express, the history expert happens to mention that the Great Moghul Shah Jahan, who had the Taj Mahal – the world’s most lavish mausoleum – built for his late wife was locked up by his son for this monument to love. Inside the Red Fort in Agra. For the rest of his life! Charged with excessive extravagance! For excursions and dinner the super-opulent train Pride of Africa has an on-board hairdresser, who will blow-dry at any time, but will only snip away on quiet stretches of track – he wouldn’t want to ruin anyone’s haircut. Days on a rail cruise are very leisurely affairs: Some sit in the library sipping a rare single malt, others tuck into scones with clotted cream while gazing out at the passing landscape, play a rubber of bridge or enjoy an indulgent soak in their ensuite bathtub. And outside? Well, life outside continues at its usual pace. The bustle of the cities, the sunshine on the fields. The locals toiling on rice paddies or cotton fields, living symbols of the Third World. Inside, it is all too easy to stifle any twinges of a bad conscience. From the outside no-one can see the lavish laissez-faire inside the train thanks to tinted windows and, vice versa, blinds or curtains can be drawn to block out the sight of too much misery. The world is unfair, and that is something no luxury train trip is ever going to change.